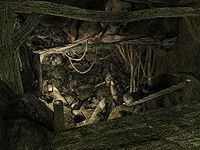 Knifepoint Ridge is a large palisade-walled bandit camp surrounding an iron and corundum mine, located northwest of Falkreath. The camp has an exterior campsite and one interior zone: Knifepoint Mine. 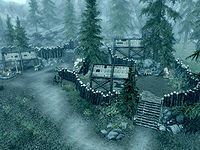 There are nine bandits roaming the main camp with several huts containing various loot or crafting tables. Working in from the perimeter where you can find up to five bandits walking around (depending on the time of day), the first hut contains a smithing forge, an armor table and a grindstone. This hut also has a novice-level chest containing varying loot of reasonable quality (gold, lockpicks, weak potions, and usually one piece of apparel). Just outside the forge, on a table, there is a copy of the Archery skill book Vernaccus and Bourlor. There is an iron ore vein just east of the smithing hut. If you take the stairs next to the smithing hut and look to the right, you will see a hut containing a table with some leveled armor and weapons. There is also, in this section of the camp, a log gate that leads to a campfire with a bandit near it. The entrance to the second zone, Knifepoint Mine, is also here. The hut in this section (the one with the table of armor adjoining this) contains an alchemy lab, and the table to the left of it has a few random potions and ingredients. The mine has one main area with a branch blocked by a cave-in. There will likely be a bandit chief near the campfire. There are two veins of iron ore here. There is a dead Imperial prisoner in a cage next to the fire; this cage has three iron ore veins and a leveled lock, with no key to open it. There is an unlocked chest and a weapon rack along the back wall, which has a pickaxe that can be used to mine the numerous veins scattered around the mine. If you have the quest Boethiah's Calling, you can descend and you will find a bandit by an alchemy table. You can continue down the path to the left, which contains a flammable gas trap, or open the locked gate, giving you a good vantage point overlooking the main room. 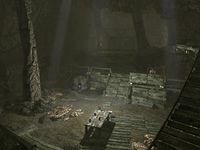 In this main room you will find the Champion of Boethiah, if you have the related quest active, as well as a few bandits. There are over a dozen corundum veins here. To one side will be a smelter, in front of a wooden ramp leading to a makeshift house; on the other, you will see a wooden walkway leading to the aforementioned locked gate. There is a locked chest under the wooden ramp, hidden near the barrel with cheese on top of it. In the makeshift house, you will find another chest. To the right of the house, you will find a small tunnel which loops back around to the main chamber, and contains several glowing mushrooms. If you climb the ridge west-southwest of the camp, you'll find some skeletal remains. The skeleton has a leveled bow and a knapsack (containing common loot), which are splattered with blood. This location may not be marked as cleared on your map if you enter for the first time during the Boethiah's Calling quest. Upon clearing this mine and returning at a later point, you may find that the tunnel leading down to the left from the first room is blocked by rock, leaving no way to progress through the mine. Exiting and reentering the mine may fix this after multiple tries. If you have already received the quest Boethiah's Calling and have the objective to kill her current champion, you will be unable to complete the quest Kill the Bandit Leader in Knifepoint Ridge. The quest marker will point to where the bandit chief stands instead of over his head, and even if you kill everyone in the mine, it will not be completed. Waiting until Knifepoint Ridge has reset does not fix the problem. A fix is confirmed for PC. First uncheck the quest tracker (in case of another bug) then type in this command in the console setstage Favor154 20 . This will finish the quest and you can turn it in to the Jarl, you wont get the gold reward though. This page was last modified on 18 June 2018, at 09:00.